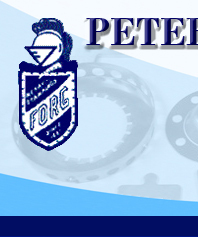 Since 1881 Peter Forg Manufacturing has been a leader in the manufacturing of custom metal stampings. We specialize in deep drawn metal parts and have the capability of stamping material up to ¾" thick. Our metal stamping equipment currently includes more than 20 modern punch presses, toolmaking equipment, shears, tumbling equipment, deburring, welding equipment, and miscellaneous such as tapping machines, radial and conventional drills. In the 1890's there was a gradual shift into metal stamping. This was the result of a growing need in the furniture, bicycle and automotive industry for metal stampings. Our tool and die makers have the knowledge and experience to produce dies on time and to the required specifications. With the help of Cad/Cam and Wire EDM the transition from blueprint to production tooling is quick. Our toolmakers will repair and maintain the dies to keep them up and running. With our state of the art stamping equipment, we're capable of delivering ¼" diameter stainless steel discs to 28" diameter stainless steel discs and every size in between. Stainless steel washers serve a variety of critical functions. When it comes to distributing load or functioning as spacers, stainless steel washers are the ideal solution that will withstand the elements better than many other materials.